Approaching organisations, govt to erect plaques at street entrances. 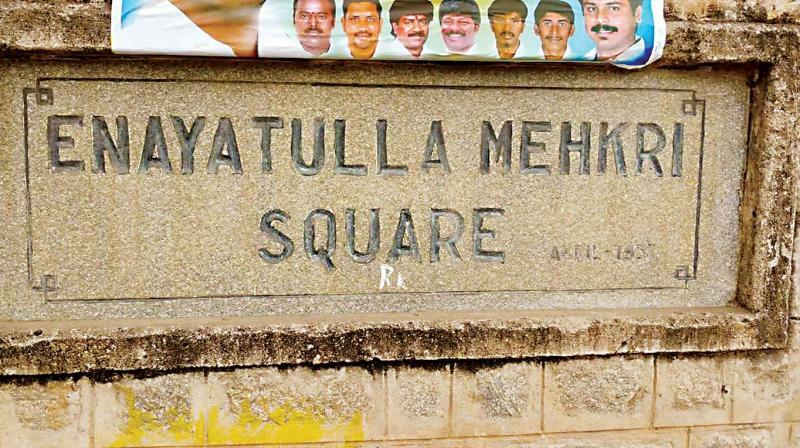 The original plaque at Mehkri Circle, named after Enayathulla Mekhri, an altruistic businessman. The plaque, however has been displaced. Bengaluru: With the city attracting people from different parts of the country, many of us have no clue about people after whom the city roads have been named and their accomplishments. A Mahatma Gandhi Road or General Thimayya Road may need no introduction, but very few may know how Mekhri Circle got its name or who was Suranjan Das and why a road has been named after him. Raghav Madhukar, a Class 12 student from Sri Kumaran Children’s Home in Mallasandra, has started an organisation, City Idols, and is approaching organisations and government officials to put up plaques at street entrances to list information about the personalities after whom the roads have been named. Many of us have no clue why a road is named after a particular personality, especially those who are not so well known, or what he or she had accomplished. Raghav Madhukar, a class 12 student in Sri Kumaran Children’s Home in Mallasandra started an organisation called City Idols to generate awareness among the public about the city. He is now approaching people, organisations and government officials to put up plaques at street entrances to list information about the personalities in whose name they are named after. This will help the public know why the roads was named after a particular person and their contributions to the society. “In many countries such plaques are famous, as it provides information about the place, street and the reason why it has been named after a certain person. At times, they will also have that person’s bust,” Madhukar added. “I want to do something similar in our city and started City Idols. I am asking people to come up with plaque designs and ideas and even information about the personalities. I am in touch with some government officers and BBMP officials to implement this initiative,” Madhukar said. He said that SPICMACAY, a voluntary youth movement that promotes classical music, dance and folk arts has been an important partner in this effort. They have introduced me to Srishti Scool of Design in the city and I am trying to coordinate with them to get students to submit design ideas. The boards bearing information will be in Kannada and English, he said. Madhukar observed that people know why the circle at Mahatma Gandhi Road junction was named after cricketer Anil Kumble, but many do not how the Mekhri circle got its name or how Jeevan Bima Nagar got its name. People will be interested if plaques are erected, he added.